Jane Austen (1775-1817) was the English author of Sense and Sensibility (1811), Pride and Prejudice (1813), Mansfield Park (1814), Emma (1815), Northanger Abbey (1818), and Persuasion (1818). The seventh of eight children of a minister and his wife from Hampshire, she grew up surrounded by lively minds, home theatricals, and her father's library. She and her sister, Cassandra, briefly attended several schools, but the bulk of Jane’s education was conducted at home. From an early age, she found her voice as an author of rather ridiculous parodies, including her “History of England, by a partial, prejudiced, and ignorant historian,” which was illustrated by her sister. Much of her early work seems to have been intended for the entertainment of her highly literate and witty family. By her early 20s, Jane Austen had embarked upon longer works, the novels we would eventually know as Pride and Prejudice, Sense and Sensibility, and Northanger Abbey. In 1797, Jane’s father submitted an early version of Pride and Prejudice, then called First Impressions, to a publisher, but the manuscript was rejected. Miss Austen seemed to meet with more success in 1803, when her manuscript of a novel called Susan (the future Northanger Abbey) was accepted and advertised as shortly to be published. However, it never appeared, and Jane bought back the rights ten years later. In 1801, Reverend George Austen retired and removed his family to the spa town of Bath. There, they had a number of residences, the most famous of which is undoubtedly 4 Sydney Place, where they remained until late 1804. In 1805, George Austen died, suddenly and unexpectedly, leaving his widow and his two unmarried daughters in straightened financial circumstances. For the rest of their lives, they would be heavily dependent upon Jane Austen’s brothers, though Jane would do what she could to alleviate their situation through sales of her novels. In 1806, they moved to Southampton, near Portsmouth, where they might occasionally see Francis and Charles Austen, who were both in the navy. In 1809, they had a more permanent offer from brother Edward. Adopted by wealthy relatives at the age of 14, Edward had now come into substantial property, including Chawton House. He invited his mother and sisters to take up residence in a cottage on the grounds. Thus, it was at Chawton Cottage that Jane Austen began to revise and polish her earlier works and pen a number of additional ones. Although she published anonymously within her lifetime, knowledge of Austen's authorship gradually spread in select circles, eventually reaching the Prince Regent, the future George IV. Ignorant of the fact that Austen detested him, the Prince was a great admirer of her writing and requested that she dedicate her next publication to him; that book was Emma, and the Prince Regent's own three-volume set is on display on a bedside table in Brighton Pavilion. 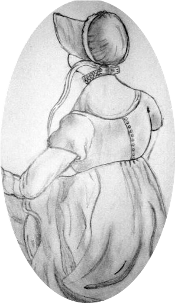 Emma also received a favorable review from Walter Scott, and Sense and Sensibility was a particular favorite of Princess Charlotte's. The fame of her works was not confined to Britain--right here in Virginia, Chief Justice John Marshall was an avid fan. He and his wife would often read Pride and Prejudice aloud to one another or to a group of friends, taking on the roles of Elizabeth Bennet and Mr. Darcy. And, in the years since Jane Austen's premature death, it has been Pride and Prejudice, the book she called "my own darling child," that has captured the public imagination most powerfully. Austen's work remained relatively popular throughout the 19th century, with several notable revivals of interest. The 20th century saw her receive ever more attention, and now in the 21st, we’re still riding the wave of her popularity, with more continuations, spin-offs, and merchandising than ever, proof of Austen’s endless relevance to our lives.